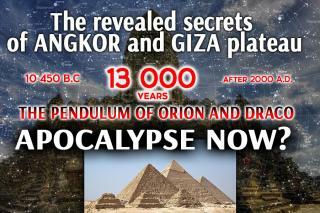 The revealed secrets of Angkor and Giza plateau – the pendulum of Orion and Draco. Apocalypse now? Familiarizing myself with information about Angkor Wat on the web, I discovered almost same things written everywhere; simply speaking, the information was taken from a single source, though many do not refer to that source, as if they wrote it themselves. I will use the same source, but will also indicate the primary source not mentioned by many. 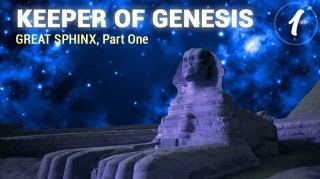 The primary source is the book Heaven’s Mirror: Quest for the Lost Civilization by Graham Hancock and Santha Faiia. 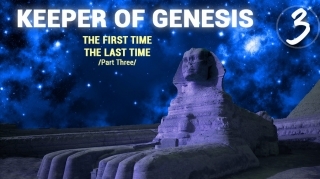 A connection between Angkor and the sky was ascertained by John Grigsby who cooperated with Hancock in 1996. 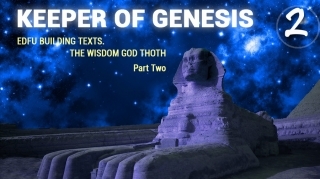 I refer to the primary source, so that everyone who desires could get to know more detailed information on the subject, while I shall only cite extracts and give some comments. It seems to us the veil has been lifted from many secrets owing to the recently published series of resonant articles Star. The Golden Ratio. We started to search for clues to puzzles and decided to follow a natural and gradual way, not jumping over steps, but going like a child: step one, step two, step three... collecting and referring to interesting facts and building hypotheses. 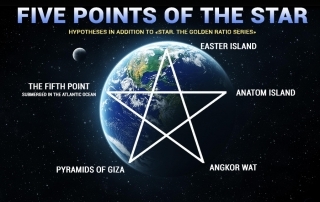 Today we shall make our first step on which we’ll elucidate information about the five points of the Star “drawn” (see map below) in the final article of the aforesaid series, entitled A new look at an old design. Jim Alison’s lines, and this is from where we will depart. This is our first hypothesis-drawing attempt, and nobody knows what we’ll eventually arrive at. We kindly invite everyone to join discussions and share opinions. Perhaps, our joint efforts will take us somewhere. As a matter of fact, joint efforts is our great advantage, so let’s delve into the subject together in order to prevent any possible attempts to claim ownership of information and hypotheses presented herein. 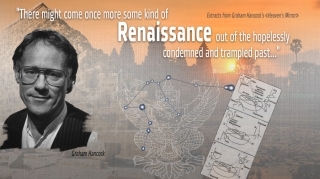 It would be absolutely unwise to leave out Graham Hancock’s works and not to include in our Prophecies section the truly unique information he has collected over the years of his research activities. 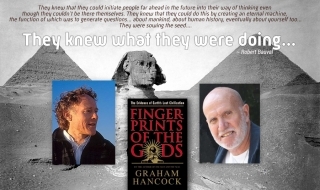 In his books the researcher one way or another touches upon the riddles of spiritually advanced ancient cultures and civilizations, as well as the single knowledge of immortality, traces of which have been miraculously preserved in ancient monuments and artefacts that are persistently ignored by mainstream science and conspiratorially suppressed in our age of general degradation and decadence. Let me continue stringing priceless beads on the necklace of our initial preamble and present three final chapters of Graham Hancock’s sensational book Heaven’s Mirror, where the first bold attempt is made to bring together numerous facts relating to the global cosmological cyclicality and to the corresponding pattern of the new great Renaissance to come. 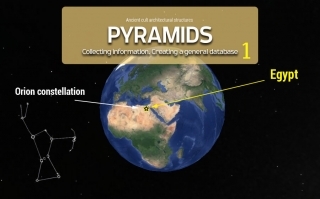 Brief descriptions are mostly taken from http://www.geolines.ru/eng. 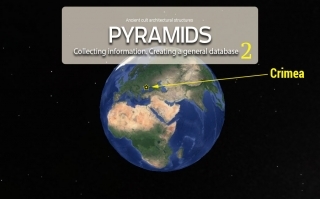 There is also a remarkable link to the Lepsius list of pyramids (https://www.wikiwand.com/en/Lepsius_list_of_pyramids), where a great number of smaller and ruined pyramids are collected. This is, so to say, just in case somebody needs more information. 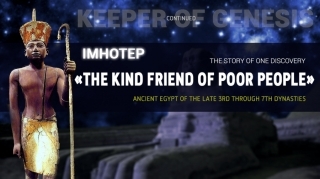 After all, main information sources pay attention to the most significant complexes only. In 1926, Felix Dzerzhinsky issued an order to carry out the second expedition of such kind, aimed at unravelling the secrets of Crimea. The expedition was entrusted to Alexander Barchenko and the Neuroenergy Laboratory he headed. Some extant data reveal the place of studies to us – it is the South Coast of the Crimean Peninsula, the area of Bakhchysarai, where very old “underground cities” have remained, whereas the expedition goal was to examine remains of ancient civilisations, as well as the knowledge left by those civilisations on control and management of energy and human consciousness. Attention! The text below contains complete quotes that are in no way distorted by the article author. Everyone understands the quotes according to his or her spiritual, moral and intellectual development! I found the implications of the Orion correlation complicated and eerie. 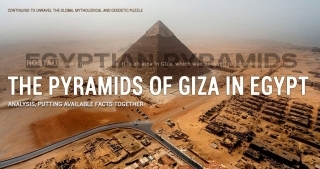 On the one hand, the Great Pyramid’s southern shafts ‘precessionally anchored’ the monument to Al Nitak and Sirius in 2475-2400 BC, dates which coincided comfortably with the epoch when Egyptologists said the monument had been built.